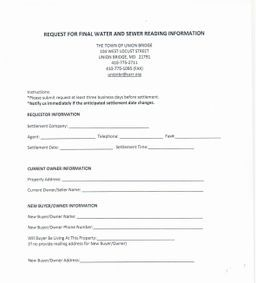 "Request For Final Water and Sewer Reading Information"
This form is for when a property is going to settlement. The settlement company needs to request a final water and sewer bill for the seller and to request a new account for the buyer. Click on the picture to open and print the pdf form, then submit the form to the Town Office. 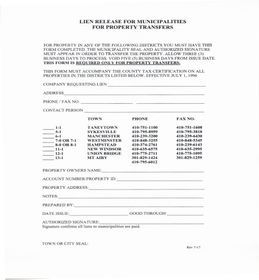 "Lien Release For Municipalities For Property Transfers"
Settlement companies have to request that the town signs off, indicating that all fees and liens have been paid on a property so that they can record a new deed. This form must also be completed if a final water and sewer reading is involved. After completing the "Project Bid" form, it must be returned to the Town Hall Office.